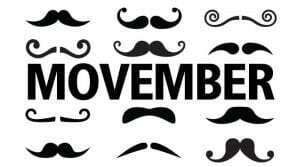 The Movember Foundation is the leading charity changing the face of men’s health, and they’re addressing some of the biggest health issues faced by men: prostate cancer, testicular cancer, and mental health and suicide prevention. They know what works for men, and how to find and fund the most innovative research to have both a global and local impact. They continuously challenge the status quo, and invest quickly in what works. In 15 years they’ve funded more than 1,200 men’s health projects around the world. By 2030, they claime they’ll reduce the number of men dying prematurely by 25%. Prostate cancer is the most common cancer among Canadian men (excluding non-melanoma skin cancers). It is the 3rd leading cause of death from cancer in men in Canada. 21,300 men were diagnosed with prostate cancer. This represents 21% of all new cancer cases in men in 2017. 4,100 men died from prostate cancer. This represents 10% of all cancer deaths in men in 2017. On average, 58 Canadian men were diagnosed with prostate cancer every day. On average, 11 Canadian men died from prostate cancer every day. Adam Garone has an impressive moustache, and it’s for a good cause. A co-founder of Movember, Garone’s initiative to raise awareness for men’s health — by having men grow out their moustaches every November — began as a dare in a bar in 2003. Now, it’s a worldwide movement that raised $126 million for prostate cancer research last year. The Library has a “Movember” Guide designed to assist you in researching topics related to the Men’s Health fields. Here you will find information about finding books, ebooks, journals, databases, videos, websites, blogs and more about the Movember Movement and Men’s Health. Look for a “Movember” display in the showcase window just outside the Notre Dame Campus Library. As well you can check out some related items in our Library Collection. We have placed several of these items in our Notre Dame Campus window display.